When it comes to preventive maintenance and ensuring the safety of employees in the workplace, proper hose selection is an essential first step. 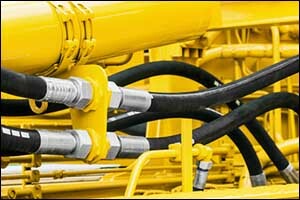 There are many different types of hydraulic hoses, rated differently based upon the type of hydraulic fluid that they can handle, as well as temperature, equipment requirements, work environment, and much more. As a result, custom hydraulic hose services are needed to ensure a proper fit. Choosing the best product for your particular needs will help you to not only increase safety but also to get the maximum life out of your hydraulic equipment. Getting started, you should measure the hose length. The length that is measured is what is considered to be the OAL or overall length measurement, which includes not just the hoses, but the entire hydraulic hose assemblies. Measuring begins from the of the male fitting to the center of the angled female fitting. If you are unsure how to do this or need additional support, contact Metro Industrial & Marine Supply. We can assist you by providing tips for proper measurement so we can create the custom hoses in Fall River that you require. You will also need to measure the hose fitting orientation, which is measured in degrees that are set in a clockwise direction. Straight up would be 0-degrees, a right angle to the right would be 90-degrees, straight up and down would be 180-degrees, and so on. Again, if you need assistance in this area for your custom hydraulic hose services, don’t hesitate to ask. There are also different types of hoses that can be used to create your hydraulic hose assemblies. Again, this will depend on the application, the hydraulic fluid, the amount of pressure, the work environment, and other factors. Industrial hose, hydraulic hose, pneumatic hose, metal hose, rubber hose, vacuum suction and discharge hose, transfer hose, heavy equipment hose, automotive hose, and other options, along with the appropriate fittings and adapters can be created for you at Metro Industrial & Marine Supply. Our made-to-order custom hoses in Fall River are designed to meet or exceed your expectations to provide you with top quality, high-performance results. Hydraulic hoses while you wait are great for anything from routine replacement to emergency services, depending on your situation. If you work regularly with hydraulic equipment or are in charge of making sure that supplies are ready and available to reduce downtime with essential machines, having all the details on your needs for hydraulic hose assemblies can make a big difference. Measuring all of the hoses and keeping track of the requirements for each piece of equipment can help you to contact Metro Industrial & Marine Supply right away to get your hydraulic hose assemblies ready for pick-up and installation. Having an understanding of your hydraulic system will also help you to improve safety in the workplace. Modern hydraulic systems have a lot more pressure and power to provide faster and stronger production. As a result, the increased heat and pressure can be dangerous if you don’t know what you’re dealing with and aren’t prepared for failure situations. While most people think about big leaks as being the most dangerous, small leaks can be deadly. When working around hydraulic equipment, safety gear is essential. An undetected pinhole leak within a hydraulic hose could inject fluid into an employee or other person standing nearby the machine. Skin penetration can happen at pressures as low as 100 PSI, which can have life-threatening results if it is left untreated. Hydraulic fluid will immediately begin to kill tissue if it enters the body, which can be deadly. The injection itself might feel like a simple pinprick and not look dangerous, but it can quickly become a big problem for the individual. Emergency treatment is required for any injuries that occur concerning hydraulic equipment hose failures and leaks. The more you can do to be actively proactive with prevention for a failure of hydraulic hose assemblies, the safer and more efficient everyone will be at your workplace. A comprehensive preventive maintenance program should be in place, and before any inspections or work is performed, the machine must be shut down and allowed to cool down completely, retracting cylinders, relieving pressure, and fully depressurizing all accumulators. Once all of this is complete, the visual inspection can begin. Have a complete checklist available for your crew or anyone performing the inspection before addressing any custom hydraulic hose services. This will help to ensure that nothing gets overlooked or missed. Take your time and don’t allow yourself to get rushed for any reason. Get any replacement hoses while you wait at Metro Industrial & Marine Supply to help get your machine back on track as quickly as possible. To learn more about our custom hoses in Fall River and the surrounding area, give us a call at 508-996-8400. Our team can answer any questions that you might have about our hydraulic hose assemblies and custom hydraulic hose services. We provide hoses while you wait for customers in the local SouthCoast region, offering same-day service for most of our hose services. We also offer shipping to customers all across the United States and around the globe, providing top quality hydraulic hose assemblies and components.